IT Operations	DISASTER RECOVERY - Get affordable, high-performance disaster recovery. Micro Focus disaster recovery solutions offer warm-backup recovery speeds similar to mirroring, but at low costs similar to tape backup. WORKLOAD MIGRATION - Migrate workloads and consolidate servers quickly. Micro Focus provide upfront analysis and planning, and deliver automatic, unattended high-speed anywhere-to-anywhere workload migrations. Designed for IT professionals responsible for backup and IT disaster recovery in remote/branch office environments as well as small and medium enterprises, PlateSpin Forge® is an all-in-one disaster recovery hardware appliance. It protects both physical and virtual workloads, and delivers mirroring-like RTO and RPO performance at a price point approaching tape. Under an hour RPO/RTO PlateSpin Forge protects workloads with frequent user-configurable incremental replications, allowing Recovery Point Objectives (RPO) as low as 30 minutes, and Recovery Time Objectives (RTO) as low as an hour or less. Easy test failover One-click test failover allows you to rapidly test the integrity of workload replication. With a mouse click, you can take a virtual snapshot of the recovery workload, power it on within a private internal network and quickly validate the recovery plan. Failover preparation In the event of a possible failure, you can power up the recovery workload in a fenced off network while confirming the failure. You can then go live with the workload rapidly "dropping the fence" to bring the recovery workload online. Multiple recovery points Allowing you to revert back to the last known good state of a protected workload. This eliminates the risk of recovering a corrupted workload. You can customize the number of recovery points to achieve an optimal balance between storage & protection requirements. PlateSpin® Protect is a disaster recovery software product that uses virtual infrastructure capacity to protect both physical and virtual workloads. It can deliver mirroring-like RTO and RPO performance at a price point approaching tape. Recover with the click of a mouse Virtual machines deliver incredibly fast recovery performance because the backup media is also the recovery environment. Beyond bare–metal restore PlateSpin Protect leverages patented technology to recover your workloads to any available server—either physical or virtual. Disaster recovery testing Quickly create snapshot duplicates of the recovery archives, and boot them into safe sandbox test networks for easy, fast—and more importantly, safe—testing. Whole workload replication PlateSpin Protect enables data centers to protect server workloads (operating systems, applications and data) within a single bootable recovery environment. Avoid hassles of manual system rebuild and data restore. PlateSpin® Migrate enables you to complete data center transformation, server consolidation, and server migration projects blazingly fast, with minimal downtime and maximum automation. 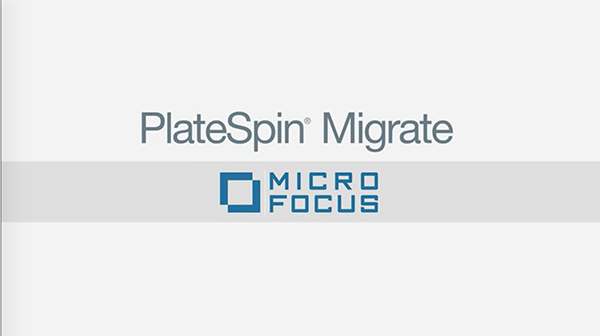 PlateSpin Migrate uses high-speed block-based transfers and Server Sync technology to deliver the fastest and most efficient anywhere-to-anywhere migrations, to and from physical, virtual, and cloud locations. Faster, more reliable migrations Accelerate workload migration and reduce errors with the highest level of automation available for workload migration, and free up valuable IT resources. Live transfer You can use Live Transfer for the migration or image capture of active servers without taking the source servers offline or having to reboot. Multi-platform support Perform anywhere-to-anywhere migrations to and from physical servers, virtual hosts, and the cloud, with broad support for various Windows and Linux operating systems. Integrated testing PlateSpin Migrate recognizes the need for testing as an important key to success and allows you to test your replicated workload intensively and easily before rolling it out in production. PlateSpin® Recon is a virtualization planning tool for complex server consolidation and disaster recovery initiatives that provides actionable data based on criteria you define. Whether your goal is virtualizing or backing up more servers onto fewer hosts, lowering power consumption, freeing up rack space in you data center, or meeting recovery time and recovery point objectives, PlateSpin Recon gives you the intelligence to succeed. Increase visibility With PlateSpin Recon you get a true enterprise-scale workload analysis, planning and management solution that works across different operating system, hypervisor, and server platforms. Take out the guesswork PlateSpin® Recon's unique workload profiling tracks actual CPU, disk, memory, and network utilization over time, on both physical and virtual hosts. Extend the life of your virtual infrastructure PlateSpin Recon's Virtual Capacity Management finds underused resources in your virtualized IT environment and lets you reclaim or reassign allocated resources. PlateSpin Migrate Integration After modeling multiple migration comparisons with PlateSpin Recon, export the best scenario to PlateSpin Migrate for immediate execution. There's no need to re-create scenarios or re-discover servers.